“On 7 June 1816 the British Parliament voted to purchase Lord Elgin’s collection of sculpted marbles taken from the Parthenon, so a Commemorative event marking this 200th anniversary was held at London University’s Senate House. Prof Cartledge explained that the British Museum was founded in what became known as the Age of Enlightenment, founded precisely for the purpose of enlightenment, for the display, contemplation and comparative study of the world’s cultural artefacts. Fatefully, in the early 19th century it changed its orientation first accepting the Rosetta Stone and then the so-called Elgin Marbles. In both cases it was a fact of war – the Napoleonic Wars – that masked and was used to try vainly to justify an act of cultural spoliation. William St Clair presented an outline of discoveries due to be discussed in his book, Looking at the Acropolis from modern times to antiquity, expected later this year. Making use of many manuscript documents hitherto unknown, including intercepted letters, firmans, reports of secret negotiations, and correspondence with Ottoman commanders, as well as unfamiliar pictures he told how such discoveries, transform our understanding of the history of the Acropolis, and of its symbolic power, and carry direct implications for current questions about the future of the marbles. Artemis Papathanassiou stressed that it is hard to find any better known dispute than that which concerns the sculptures from the Parthenon and her presentation looked in detail at the most recent processes involving the Greek request to the British side to reach a mutually acceptable solution on the issue by making use of the UNESCO Rules on Mediation and Conciliation. In concluding her valuable presentation, Artemis highlighted and commented on specific parts of the letters rejecting the request for mediation and informed the audience on future steps, both legal and diplomatic, that might be taken by the Greek Government. Tristram Besterman reflected on the democratically accountable museum, and how we should open up the museum as a space where other voices are heard. He argued that no cultural institution should be above challenge and that while museums are in the business of stewardship: of tangible cultural resources (scientific, technological and artistic) for the benefit of humankind, Western encyclopaedic museums need to act as beacons of cultural equity to mitigate the deep divisions in society that they may otherwise represent. He went on to say that while they might benefit humankind through the study and enjoyment of many cultures in one place they must also address issues raised by the possession of cultural material whose provenance is demonstrably tainted. Concluding that museums send out a powerful message when they recognise their accountability to peoples. Dr Victoria Solomonidis, FKC spoke of Melina Mercouri’s contribution explaining that her visits to Britain spanned three decades first as an actor and then as Minister of Culture, which led to her 1983 request for the return of the Parthenon Marbles. These requests would not wane over the next decade and she made them in the ‘name of fairness and morality’. “And the Parthenon Marbles they are. There are no such things as the Elgin Marbles. There is a Michael Angelo David. There is a Da Vinci Venus. There is a Praxitelles Hermes. There is a Turner “Fishermen at Sea”. An abridged version of his contribution follows. “Greece has been friends with the people of the United Kingdom for centuries, through good times and bad. Not only is there a strong spirit of philhellenism amongst British people, the admiration has been mutual: there is a long tradition of Greek anglophilia, even amongst those who have publicly lamented the loss of the Parthenon marbles. I would thus like to say this to our friends, the people of the United Kingdom: you are not to blame for the fact that the Parthenon marbles were brought to the British Museum. It was not Britain that stole the Parthenon marbles from Greece – it was Lord Elgin; acting for personal gain and outside of the scope of his official authority as Ambassador to the Ottoman Government in Constantinople. So we say to you: thank you for looking after the Parthenon marbles but, as many of the leading thinkers amongst your compatriots have recognised, it is time to send them home. In March 1807, even before the marbles arrived in London, Lord Byron wrote his epic satirical poem, “The Curse of Minerva” (the Latin name of the goddess Athena). Through the goddess, Byron curses Lord Elgin to be forever hated: “Loath’d in life nor pardoned in the dust”. But he goes further: Britain is also to blame and must also be cursed. Invoking Britain’s perceived 1805 abandonment of its European ally, Sweden, after the battle of Austerlitz, Athena pronounces that Britain will be left “hated and alone”. But what Byron didn’t know at the time of writing The Curse of Minerva, was that Britain did stand by its ally and it was not left “hated and alone”. Shortly after the poem was written, Britain renewed its support of Sweden – including sending a naval expedition to protect it against an expected French invasion. Not long after, Napoleon was defeated by an alliance of European powers led by Great Britain and including Sweden. Perhaps this is why the poem was not published in Byron’s lifetime. Great Britain’s loyalty to her allies and Greece in particular has been proved on numerous occasions, since, notably during World War II. Thus, Byron’s extension of Athena’s curse to include Great Britain and its people was not justified and was unfair. Since the earliest times, there has been a long and growing tradition of enlightened British people who have recognised that, whatever the legality of Lord Elgin’s actions, the United Kingdom has no moral claim to hold the sculptures indefinitely and that they must be returned. 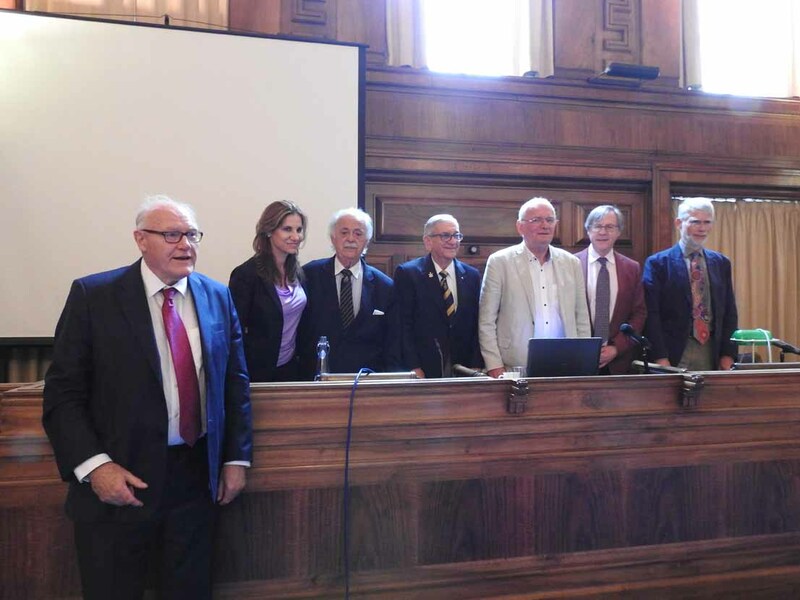 Emanuel John Comino AM explained how Melina Mercouri and the many British historians that wrote passionately about the plight of the Parthenon Marbles inspired him. He stressed that he was in accord with the will of Greece to pursue diplomatic avenues, to find a mutually beneficial way forward through cultural co-operation. Emanuel paid tribute to BCRPM’s erudite Chairman Eddie O’Hara who had sadly passed away before the 07 June Commemorative Event. Presenting a commemorative plaque to Stuart O’Hara, Eddie’s grandson and a member of the BCRPM, he said, “Eddie was a special campaigner and a dear friend, he will be missed by us all and we want to thank him for the recognition he offered our committee as a campaigning body and the inclusion with which he offered to so many campaigners. He was instrumental in initiating and organising London 2012 Colloquy, which was followed by our Sydney Colloquy in 2013 and Michael Reppas’ American Committee’s 2015 Athens Colloquy. Russell Darnley OAM said that through education the fallacy of the British Museum’s claim that the Marbles are in the best place, can easily be exposed and that providing “a holistic understanding of the Parthenon renders the locating of elements from the Parthenon in the British Museum absurd. It is the product of a misconception about human development and human achievement. Follow this link to a report on the event by the Greek Embassy for the United Kingdom. This is another hue of Attican light. Here the relationship between the Parthenon and its environment is dynamic. It is the complete opposite of the dingy British Museum where the #ParthenonMarbles taken by Elgin are still held.